Check out these adorable Rice Krispie Treat Ornaments for Christmas! A Fun Holiday Dessert Recipe for Kids and the perfect Centerpiece for your Christmas Table! 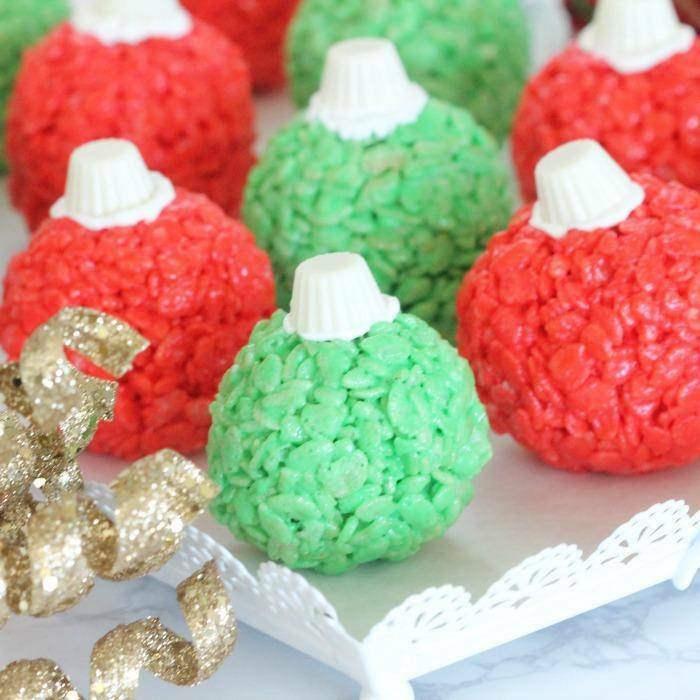 If you are looking for a FUN Treat Recipe this Christmas, these Rice Krispie Treat Ornaments are PERFECT for your Holiday Dessert Table! I LOVE making fun things for the Holidays! Festive treats and dessert recipes are my FAVORITE! I hope you have fun making this one with your kids! It’s a fun treat to take to your co-workers or your neighbors! Plus, they are SUPER simple and a holiday staple! All you have to do is add the finishing touches for these adorable ornaments! In a small decorating bag place White Chocolate Melting Chips, Heat on high 30 seconds in the microwave, repeat until melted completely. Place a small circle of melted chocolate on the top of each Rice Krispie Ball and attach a Mini Reese’s Cup. Using 2 separate bowls, in each bowl place 1/2 stick of butter (1/4 cup), 4 Cups of Marshmallows. Melt on High for 1 minute in the microwave. Stir well until smooth and creamy. Add in Red or Green Food Coloring into separate bowls. Mix well, then stir 4 cups of Rice Krispies in each bowl. Form Balls out of the Rice Krispie Mixture and set aside. I hope your kids and family enjoy this as much as my kids do! It’s a fun Holiday Treat in our house and is one of our new favorite Holiday Traditions! Pecan Pie Cookie Bars Recipe! Black Friday & Cyber Monday Sale on Meal Plans!